This is a carpet we cleaned in West Watford. When people select a carpet to be laid in their home there is often a discussion about choosing one that will withstand the expected use. Individuals can be very careful about not wearing their shoes, not eating in rooms with carpets or being generally careful. While this is their best intention, it is not always possible. Generally day-to-day life means that we don’t live like this. When a darker carpet is selected, you can sometimes fall into bad habits, knowing that the carpet won’t show such dirt. As we explain with so many other cases this carpet generally did a very good job hiding a multitude of sins. Its dark colouration and mottled appearance meant that every day wear and tear was hidden pretty well. It is only then when you start the carpeting cleaning process that the level of dirt becomes evident. This carpet had experienced heavy usage and our client knew it was time to get it deep cleaned. Professional carpet cleaning is fast and efficient. Our high-powered machinery gets to work breaking down the dirt and lifting it away. It is really satisfying to see such an incredible change in the carpets. Our client was over the moon and all dirt and stains were successfully lifted. 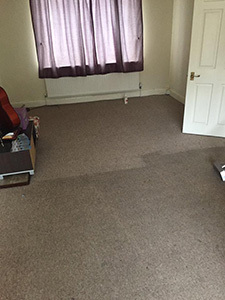 Our clients are then left with hygienically clean carpets; what better inspiration to re-start that routine of not wearing your shoes and being more careful? We also provide our customers with information on how to clean stains and how to generally care for their newly cleaned carpets. Are you looking for a carpet cleaner serving the Buckinghamshire area? Call today on 0800 695 1118. You can also take a minute to view some of our client reviews on Checkatrade. This allows you to build up a picture of our professional cleaning services.